The folks at StumbleUpon do their best to ensure that you only see the highest-quality content when you Stumble, but hey, they’re human and mistakes can happen. When the rare mistake occurs, they need your help to tell them about it. If you’ve Stumbled upon a website that you consider to be of poor quality, just tap the Thumbs Down button near the lower right on your screen to let the StumbleUpon folks know that they have to step up their game. If you have more specific objections to the content that your app has served up, tap the More button — the button with the three dots stacked on top of one another at the lower (far) right of the screen. Doing so brings up a new screen where you have an option to reload the page — assuming that you had some problem with the original connection — or the option of reporting an issue. 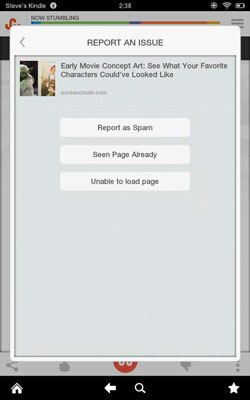 Tap the Report an Issue option to move on to a new screen with the three options. Report as Spam: Anytime you Stumble upon a web page or website that is spammy, illegal, or deceptive in nature, StumbleUpon wants to know about it. Tapping this button alerts the StumbleUpon Quality and Community Support teams. Any website that “just happens” to ask you to provide personal details such as your Social Security number, banking information, and so on, is definitely up to no good and should be reported Immediately. Seen Page Already: Just as the name implies, you’ve Stumbled upon a web page or website you’ve already seen before and really don’t want to see it again. Unable to Load Page: If the web page or website you’re trying to access will not load properly or does not load at all — Oh no! Not the dreaded “404 Error” message! — you can let StumbleUpon in on the bad news by tapping this option. For more on reporting a bad web page, visit StumbleUpon. In the search box at the top, type report bad web page and tap Enter.